This hardwood chess board is made from Maple and Walnut, and measures 20" square. The technique involves resawing solid wood to 1/8" thickness before making the board, so that wood movement doesn't break the board apart over time - beware of "solid" chessboards that aren't made this way - your corners won't hold up. Other woods are available, and price varies. Suggested combinations include bloodwood and birdseye maple, purpleheart and yellowheart (pao amarello), kingwood and tulipwood, ebony and holly, or pick your own woods. 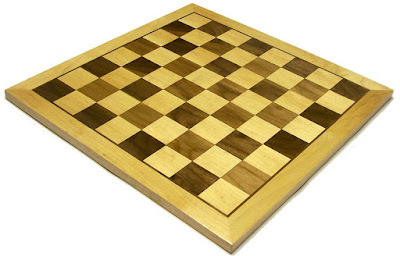 Size can also be adjusted to fit the chess set you want to use, or order a chess set made from the same woods to match. Choose your finish, or choose maple or walnut or other hardwoods if you want to make it fancy. A perfect gift for Mom's rustic decor, or dad's desk at work. Price does not include jar - special shipping for glass makes it cheaper for you to buy a box of 12 at your nearest grocery store. I can add it if you want, just let me know. By clicking on "Order Now," buyer agrees to these terms.